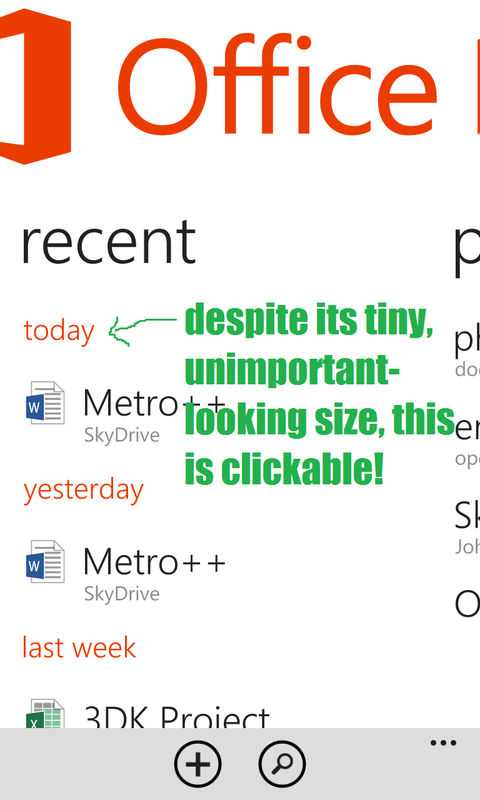 Metro++ | Is that text clickable or not? Now, how can Microsoft (or an OEM with some significant rights to customize the OS) solve this problem? Redesign the entire OS. No. Delineate between clickable and non-clickable text with additional graphical elements. 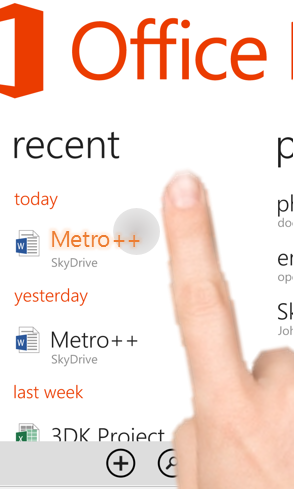 In the Metro UI guidelines, MS shows how to make a clear distinction between graphical elements that serve as buttons and those that don’t: Put them in a circle or a box. A circle/oval would be impossible and look out of place. A rectangle around actionable text would work, but add a lot of clutter, especially if there is a lot of actionable text. So…No, but getting warmer. I think the solution is right under our nose…or somewhere between the nose and the screen. I am of course referring to smell-based computing the hover! 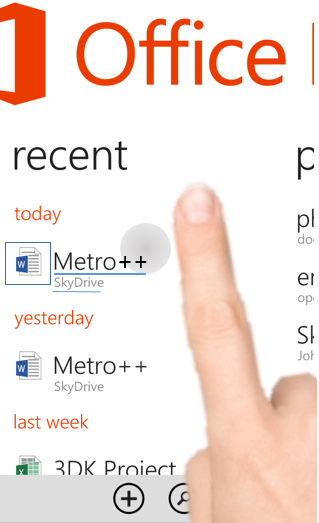 Of course both of those relied on a cursor, which doesn’t exist in a touch interface. Can we make an equivalent of this “I’m here, but not clicking on it” function in a touch screen? Any of these would address this discoverability shortcoming in Metro, and also look pretty darn cool and futuristic, which helps sell devices at retail, and adds another layer of sophistication in human-device interaction that would make iOS and Android look a bit dull by comparison. Also in Metro, an added bonus is the ability to have graceful degradation from Touch to Mouse, since the onHover signals can just as well apply to MouseOvers. So, that’s what I’d like to see. 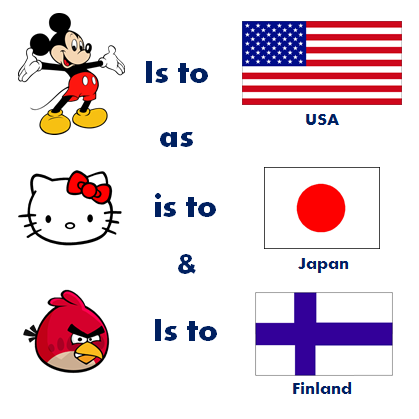 Get to it, Microsoft! I love Metro. It’s clean, fast, refreshingly different, and beautiful. But that doesn’t mean it is perfect. 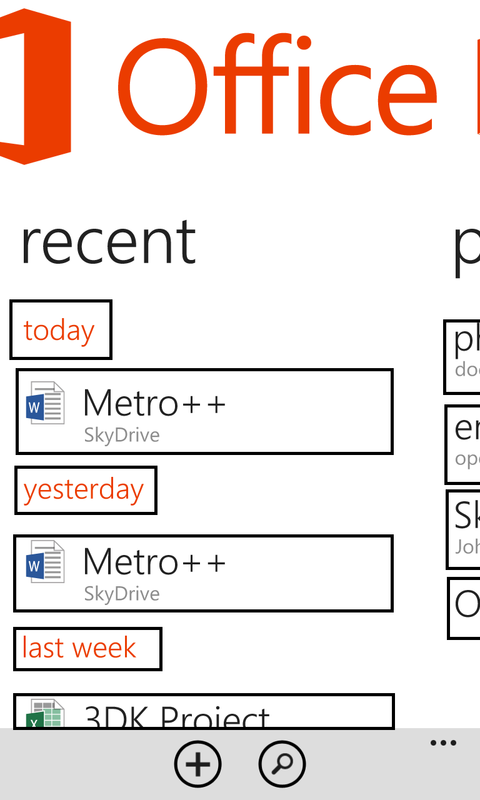 I hope to write some blog posts on how I would improve Metro, and the Windows (and Windows Phone) experience. Samsung (which sells more Google Android devices than any other company) is making its own mobile ad service. Well. It’s a good thing Google doesn’t make its money from mobile ads, right? How are you? I’m doing fine (but then again you probably knew that already from all the data you’ve collected on me). That’s what I wanted to talk to you about, actually. Google, as you continue to make it easier for us to be tracked all over the Internet (and harder for us to opt out), it seems to be dawning on more and more people (though I would say far from a critical mass by any stretch) that the Google we all know and love is steadily creeping away from its original mission of simply being the world’s best search engine. I’m not going to ascribe this to some sort of evil intent as others seem to be all too happy to do. I get (and rather love) capitalism, and understand you need to make money to continue existing. I understand that it costs money to build and run your awesome Internet services (I for one am particularly dependent on Gmail, contacts and calendars—all of which work swimmingly with my Nokia Lumia, thanks for that btw). Right now the only currency I can use to pay for most Google services is myself—my eyeballs and my data, which are worth a certain monetary amount to you. Let’s eliminate the middle-man (advertisers) and let me give that money directly to you. In exchange for a monthly or annual fee, you will give me the Google services I know and love with no ads, and no tracking tools behind them. You can detect my device’s useragent to ensure an optimal experience, and my location if I choose to share it with you, but everything else about me remains my business and nobody else’s. I get a better service—cleaner, and without the analytics gobbletygook that is now pushing the size of a typical web page up to 1 MB, probably a good deal faster too. Meanwhile, you get the same money you would have gotten—and possibly more if you charged a premium over what you would have made on ads (I don’t know if you make $100 a year on me now, but I’ve been known to pay that much for .Mac/MobileMe, and those didn’t even work). Moreover, it’s not as if this were an unprecedented idea; it’s precisely how a growing number of apps work. For the typical Zynga game, there is usually the option of a free, ad-supported version and a paid, ad-free one. Apps give us a choice of pay or ads, why can’t Google? I know plenty (if not the majority) of your users don’t want to pay, and are happy to deal with ads to get Google services for free. But you should offer the option satisfy your power users. Think of it as the Android Nexus version of Google writ large. Make Nexus premium brand across all of Google's properties. In short: Google, you deserve to be paid for your services. I just wish you’d take alternative forms of payment besides my eyeballs and my personal information. Oh, and Facebook: Same goes for you.